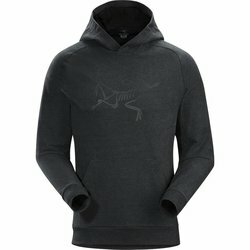 ARC'TERYX Archaeopteryx Pullover Hoody. Classic pullover hoody combines a soft cotton face fabric with a polyester backing for moisture management. Features a comfortable hood, kangaroo pocket, and the Arc'teryx bird logo on the front.